Retail environments are very complex, and a retail management software system helps to impose order within that sometimes chaotic environment. 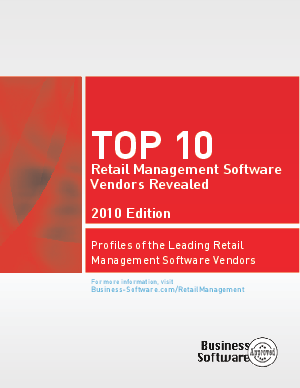 Business-Software.com's 2010 Top 10 Retail Management Vendor Report is a comprehensive buyer's guide featuring research from top IT analysts. The report helps retail management system buyers assess their needs, educates them for the selection process, and offers a list of the best retail management software vendors. Additionally, the Top 10 Retail Management Vendor Report offers: highlights of each vendor's strengths in point-of-sale (POS) processes, inventory management (and more), and vendor background and contact information to help you get started.